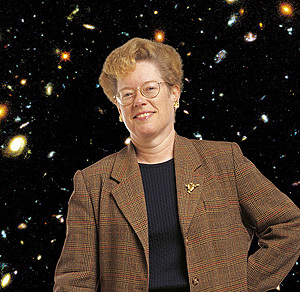 Astronomer Sandra Faber, with the Hubble Deep Field in the background. Photo by R. R. Jones. Sandra Faber, University Professor and chair of astronomy and astrophysics at the University of California, Santa Cruz, has been chosen to receive the 2009 Bower Award and Prize for Achievement in Science from the historic Franklin Institute in Philadelphia. Faber is being honored for "extraordinary advances in our knowledge of the properties of distant galaxies, dark matter, large scale structure of the Universe, and black holes in galactic nuclei; and for innovative leadership in the development of astronomical facilities." The Bower Award and Prize, which includes a gold medal and cash prize of $250,000, is among the nation's richest science prizes. It was established in 1990 through a bequest from Henry Bower, a Philadelphia chemical manufacturer, who also endowed an award for business leadership. The Franklin Institute Awards Program dates back to 1824, when the institute was founded by a group of leading Philadelphians. The awards honor individuals whose great innovation has benefited humanity, advanced science, launched new fields of inquiry, and deepened our understanding of the universe. They are among the oldest and most prestigious comprehensive science awards in the world. "Sandy Faber has had a profound influence on modern cosmology for more than a third of a century, and she is still going strong," said UCSC Chancellor George Blumenthal. "Sandy has a mind that probes to the core of all issues surrounding our knowledge of the universe, and it is this drive toward understanding which has led to the many important discoveries that have characterized her career." Blumenthal, a professor of astronomy and astrophysics, collaborated with Faber and UCSC physicist Joel Primack on groundbreaking research that established the role of dark matter in the formation of galaxies. Faber is renowned for this and other research on the formation and evolution of large-scale structure in the universe. She and a group of colleagues were the first to detect high-speed flows of galaxies on cosmic scales. She is currently involved in several projects, including a major survey of distant galaxies (the AEGIS survey), studies of supermassive black holes in the centers of galaxies, and the development of adaptive optics systems to sharpen the images of groundbased telescopes. A leading authority on telescopes and astronomical instrumentation, Faber has been closely involved with both the Hubble Space Telescope and the W. M. Keck Observatory in Hawaii. Her many honors include Harvard University's Bok Prize, the Dannie Heineman Prize for Astrophysics, and election to the National Academy of Sciences, the American Academy of Arts and Sciences, and the American Philosophical Society. Faber joined the UCSC faculty in 1972 and in 1995 was made University Professor, the highest honor for faculty in the UC system. She earned a B.A. in physics from Swarthmore College and a Ph.D. in astronomy from Harvard University. Faber will receive the Bower Award at a ceremony in Philadelphia on April 23. The Franklin Institute is also hosting a panel discussion on April 22 in her honor. The awards event, considered one of the preeminent social events in Philadelphia, crowns a week-long series of activities aimed at education and outreach to bring science to the community. The Bower Award and Prize for Achievement in Science is presented annually to a distinguished member of the international scientific community for work in a prescribed discipline that changes every year. The year 2009 was designated for physics, and "the cosmos" was chosen as the theme. The Franklin Institute solicited external nominations, and Faber was chosen for the honor by a Bower International Selection Committee consisting of leaders in the field.